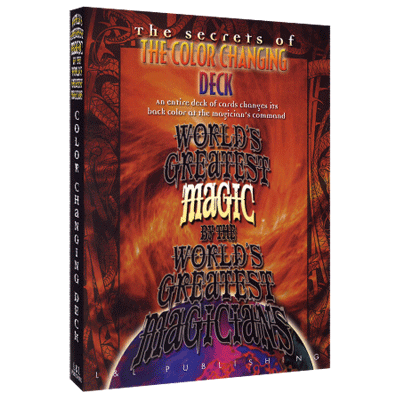 One of the key elements that makes magic entertaining is that of surprise and one of the ways that magicians have accomplished that over the years is to take a deck of playing cards that have been in use and magically change the back design color. Numerous masters of close-up magic have turned their creativity to this plot - Dai Vernon, Edward Marlo and Paul Curry are just a few of the many - and the results have been finding their way into the commercial repertoires of magicians ever since. You'll meet seven different performers, each with their own take on this miracle of card magic. Bill Malone is first with his version of Ed Marlo's creation where the backs of three selected cards change color, followed by the rest of the deck. Harry Lorayne demonstrates his version of the trick (with an amazing vanish of the entire deck after the startling color change) followed by Michael Ammar's demonstration of Dai Vernon's Color-Changing Deck. Johnny Thompson offers Paul Curry and Oscar Weigle's seminal creation while Boris Wild's marketed routine features three different colors! The legendary Derek Dingle performs one of his classic routines that combines Vernon's Triumph concept with the Color-Changing Deck while John Mendoza offers a version where, once again, three selected cards change color just before the entre deck follows suit. The Linking Ring's Phil Willmarth once wrote, "Color-changing deck routines are strong and an ideal way to start a program of card effects." As evidenced by the powerful and varied routines, it could also be argued that they would also make an ideal finish. After all, what stronger magic could you do than changing the color of an entire deck of cards?